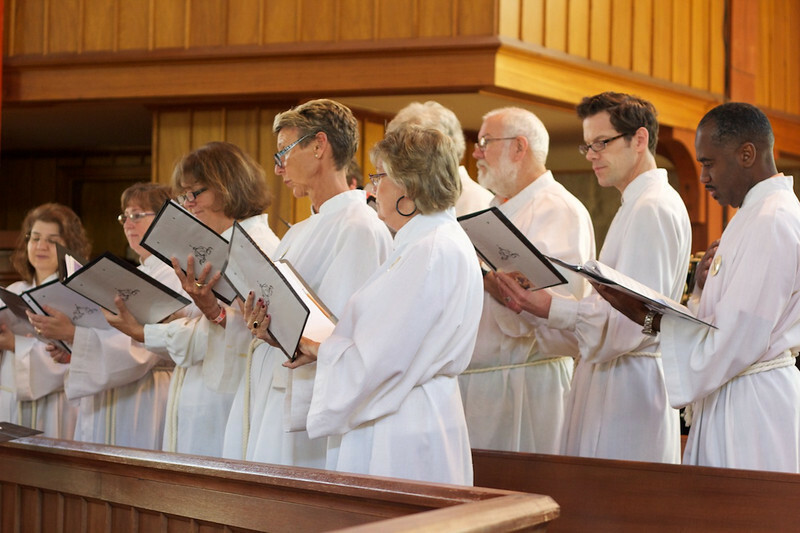 Music plays an essential role in the worship life of St. John's. Musical choices encompass a variety of styles in one blended worship service. We use hymns from Evangelical Lutheran Worship, the ELCA’s hymnal, as well as material from African American traditions, chant-style singing from Taize’ and Iona, as well as resources from the global Christian community. Our adult choir assists in the regular leadership of the Sunday worship service and provides special music as needed. During the school year, the choir practices on Wednesday nights at 7:00 p.m.
Liturgical music might be anything from the ELW to a setting by our own musicians. Instrumentation might include pipe organ, piano, oboe, African drums, brass, Indonesian ankglungs, or global instruments depending on the character of the musical selection. Members and friends of St. John's of all ages often share their musical gifts during Sunday worship. Instrumental and vocal soloists and small ensembles are actively encouraged to perform a prelude, an offertory, or a hymn. Jeanette Burgess, St. John's Director of Music, works with members to coordinate their musical gifts with the worship needs of the church. Since our musical makeup is ever changing, and to ensure all who want to participate have the opportunity, much of our music is provided by “occasional ensembles” such as our Sunday School children, Ponce Pearls (women of the congregation), and the Oakdale Boys (men of the congregation). If none of these strike your fancy, speak to Jeanette about creating a new one! 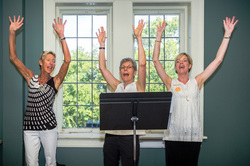 Most Wednesdays from September through May, the choir will be “la-la-la-ing” in the choir room from 7 PM-8:30 PM. The group provides musical leadership in Sunday worship, typically contributing a hymn during the Offering and a sung psalm. Practices are relaxed, yet professional and focused, offering an opportunity for musical fellowship with a circle of St. John's vocalists. St. John’s is fluid in its musical resources and choir is no different. We realize that the demands of today's society mean that the ability of members to commit to participating in an organization such as the choir may be a challenge. Have no fear! If you love to sing and are only in the area for a short time or can’t commit to a full year of singing, we’d love for you to join us for a season - or more - or less! If you can only give enough time to sing on a special festival like Easter or help out with an anthem that takes more singers, you will still be embraced by the choir for what you can do. Another St. John’s perk: About once a month, we have what we call Tacet Wednesday, which mean choir members get the night off and just help support the congregation the following Sunday, without big “special music” responsibilities. The St. John's bell choir rehearses after worship on the second and fourth Sundays of each month. 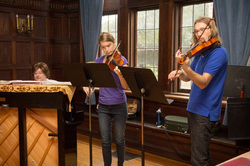 This group prepares musical voluntaries and participates frequently in the various liturgical needs of worship services.